Rediff.com » Getahead » Mediclaim: Can you claim money for medical tests? Mediclaim: Can you claim money for medical tests? Have a query regarding health insurance or mediclaim policy? Maybe we can help. Drop us a line and our expert, Harsh Roongta, CEO of Apnapaisa.com, will answer it. Please write to us at getahead@rediff.co.in with the subject line as: Health insurance query. Given below are answers to five questions most frequently asked by a large number of our readers. Recently my wife underwent abortion. Can I claim that money through my insurance? We have insurance from Apollo. Some individual policies issued by Apollo cover two deliveries or terminations (with a limit on the total amount payable) or either during the lifetime of the insured but after a specific waiting period. So we would request you to read your policy document or ask your insurance agent for more details. Check for how long have you had the policy and whether you qualify for the same. If you are covered by your employer (who has taken the policy from Apollo) you will need to check whether the group policy covers such expenditure. I have a corporate health insurance policy. Recently I had to hospitalise my mother in early morning hours due to giddiness, headache and difficulty in walking and sitting. She was admitted for 30 hours and tests like MRI, CT Scan, and X- ray were done. No major issue was diagnosed. The doctor then advised us some medicines for next 5 days and meet him after 5 days. When I submitted the bills to the insurance company, they say that it was more of an investigative case and didn't seem like adequate treatment. I am not able to understand this. They say as per the policy they can't give anything. I want to understand if our corporate house took some cheap policy? I spoke to many of my friends in other companies who told me that they never see such kind of issue. If one is hospitalised the claim should be made for any investigations done. Please suggest if my company has not taken the correct policy. Your anguish is understandable given that the general perception is that any cost incurred on hospitalisation are covered in a mediclaim policy. However, most mediclaim policies permanently excludes general diagnostic tests even if done while hospitalised if it is not for the purpose of treating or diagnosing an illness or injury. Even the policies that allow expenditure for diagnostic tests etc normally do so after a waiting period of a few years and with a very low limit of around Rs 5,000 to Rs 10,000. Look at it from the insurance company's perspective. Wrong and fraudulent claims are a bane of this industry and it is easier to make such claims when only diagnostic tests are required and no illness or injury exists. These wrongful claims will ultimately affect genuineness, as the insurance companies will need to hike premium to meet the claims on this account. Hence it pays you only when you are suffering from an illness or accident. It doesn't pay you for getting a diagnostic done. My mother is 70-year old. I want a mediclaim policy of Rs 1,00,000 cover for her. Kindly guide me. There are very few options available to you at this age of your mother. Varishta Mediclaim from National Insurance and Silver Health from Bajaj Allianz General are plans, which are specially meant for senior citizens. Both of them allow coverage of pre-existing diseases after first policy year with co-payment of 10 per cent and 50 per cent respectively. Bajaj plan is renewable till the age of 75 years and National Insurance plan is renewable till 90 years of age. Note: Co-payment refers to the percentage of chargeable expenses that the insured person has to pay. Only the balance is payable by the insurance company. I am 45-year male having CKD stage 3. Can I have any health policy? It is very unlikely that any insurance company will give you a health insurance policy when you are already suffering from CKD (Chornic Kidney Disease). 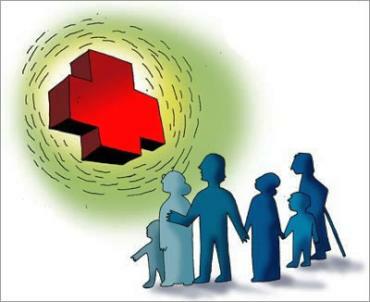 Even if you manage to get a policy, please keep in mind that any health insurance policy has a clause of pre-existing diseases. This ranges from end of 3 years till 5 years and varies from one policy to another. So any expenses arising out of CKD will not be covered for the next as many years mentioned in the policy. If a large company employs you, your best bet would be to get the employer to take a group insurance policy that normally covers pre-existing diseases as well. I already have a policy but how shall I claim it? You need to submit all the documents of hospitalisation to the TPA (third party agency) of the insurance company from whom you have bought the policy. Along with that you need to fill up a form and submit it. The TPA will verify the claim and forward you the cheque of the reimbursed amount. Some companies handle the claim formalities directly. Visit the concerned company's website and download the necessary claim form and the procedure for making the claim. Apnapaisa is a price comparison engine that allows consumers in India the ability to compare the EMI, interest rates and other fees for home loans, car loans, personal loans, business loans, credit cards, compare online quotes and features of life insurance, health insurance, car insurance, travel insurance and other general insurance policies in India.